This fungus is a relative to the wood ear mushroom and is picked to be prepared either as a fresh or a dried mushroom. Fresh cloud ear mushrooms can only be stored refrigerated for several days before they begin to spoil. The dried variety will store in airtight containers for long periods of time, but are lacking significantly in flavor. The older the mushroom, the greater the chance that it will be tougher in texture when cooked, so it is always wise to cut the mushroom into narrow strips for cooking and serving. Cloud ears can be served in salads, soups, stews, and stir-fried dishes. 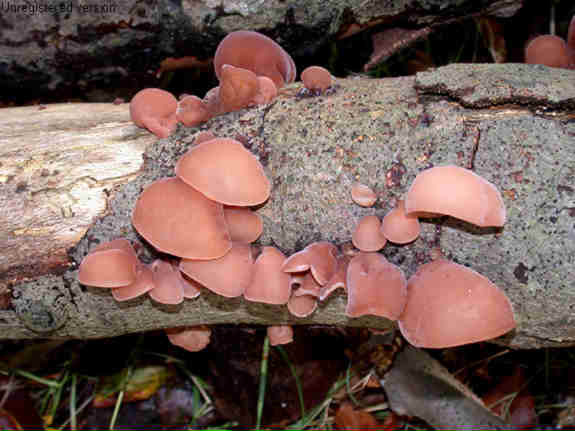 People overlook its nutritional value because wood ear is such an inexpensive food for cooking. Actually, it has more protein, iron and vitamins than white fungus. Similar to white fungus, wood ear also makes good nourishing food. Wood ear has the reputation of "meat among the vegetables". It helps to prevent various forms of bleeding, for example, blood in feces, hemorrhoid bleeding, excessive menstrual flow, etc. Its translucent brownish beige flesh is gelatinous but firm, crunchy and relatively tasteless. They absorb the liquid in which they are cooked and take on the taste of the other ingredients. The Shanghainese Hot and Sour Soup must include shredded wooden ear to have the right texture. Adding wood ear to braised meat dishes enhances the flavor. Using wooden ear in vegetarian dishes adds an extra shine to the dish, thickens the sauce and makes everything more flavorful. For Beef: Season the beef with pepper, place in a mixing bowl, and add the soy sauce, sugar, sherry, egg, and ginger. Mix well and let marinate for 30 minutes. For Rice: Soak the mushrooms in a bowl of warm water for 20 minutes. When rehydrated, cut off the stems and dice. Heat 2 tablespoons of the oil in a wok. Add the ginger and onion, and stir-fry over medium-high heat for 3 minutes. Add the mushroom stems and caps, and stir-fry for 2 minutes longer. Add the salt, sugar, and soy sauce, and stir-fry for 1 longer. Add the rice and stir-fry for 2 minutes or until warmed through. Heat the remaining tablespoon of oil in another wok or large sauté pan. Season the eggs with salt and pepper and gently stir-fry for about 1 to 2 minutes, or until just set. Add the peas and stir-fry for 1-1/2 minutes longer. Add to the rice mixture and mix well. Transfer to a warm serving bowl and keep warm. For Stir-Fry: Heat the oil in a clean wok until just smoking. Mix 1 tablespoon of the cornstarch and flour in a small bowl. Remove the beef from the marinade and dredge in the cornstarch and flour mixture. Stir-fry in the oil over high heat for 2 minutes. Remove and drain on paper towels. Pour off the remaining oil, leaving 2 tablespoons. Reheat the wok, add the snow peas and stir-fry over medium-high heat for 1-1/2 minutes. Remove with a slotted spoon and place on serving plates, forming a bed. In a small bowl, mix together the soy sauce, ketchup, Worcestershire sauce, oyster sauce, water, and sugar. Add to the pan, stir in the remaining 1/2 tablespoon of cornstarch and the ginger, and bring to a boil. Add the reserved beef and stir-fry for 1 minute, coating the beef with the sauce. Remove and arrange on top of the bed of snow peas. Garnish with the scallions and serve with rice. Soak noodles in warm water for 20 minutes and cut into 1 inch lengths. Soak Tree Ear in warm water for 30 minutes, drain and finely chop. Combine the filling ingredients in a bowl and set aside. Cut a round rice paper sheet into quarters. Place the cut rice paper on a flat surface. With a pastry brush, paint beaten egg over the entire surface of the rice paper piece. Before filling, wait for the egg mixture to take effect, softening the wrappers (2 minutes). When the wrapper looks soft and transparent, place about one teaspoon of filling near the curved side, in the shape of a rectangle. Fold the side over to enclose the filling and continue to roll. After filling all the wrappers, pour the oil into a large frying pan, put the spring rolls into the cold oil, turn the heat to moderate, and fry for 20 to 30 minutes until a lovely golden brown. Bring a medium saucepan of salted water to the boil. Add chicken and bring back to boil. Remove from heat. Drain and set aside for 5 minutes to cool slightly. Pat chicken with paper towel to remove excess moisture. Thinly slice widthways. Heat oil in a medium saucepan or wok over high heat. Add ginger and chicken, and cook, stirring, for 2 minutes or until fragrant. Add chicken stock, shaoxing wine, soy sauce and white peppercorns. Bring to the boil. Add mushrooms and garlic stem, and remove from heat. Ladle evenly among serving bowls and serve. Soak lily buds and tree ears in boiling water in separate bowls for 1/2 hour or until soft. Pick off and discard the hard ends if any, of the lily buds. Pile buds together, then cut in half. Wash the tree ears several times, drain, squeeze dry, and break into smaller pieces. You should have about 1 cup. Set aside with lily buds. Hand the bean curd gently. Slice it 1/4 inch horizontally, then cut again 1/4 inch vertically. Sprinkle with 1/4 teaspoon salt and set aside for 10 minutes. Combine in a 2 quart size saucepan or pot the chicken broth and water, 1/4 teaspoon salt, sugar, and the soy sauce. Bring to a boil over high heat, add the pork strips. Stir around to separate the pork strips. Remove the scum, if any. Then add the lily buds and tree ears. Cook together over moderate heat for 2-3 minutes. Pour off excess water from the bean curd and drop into the soup. Add the pepper and vinegar and slowly bring to a boil. Mix the cornstarch and water well and pour into the soup. Stir gently until it thickens and boils again. In a bowl beat the egg thoroughly. Remove the soup from the heat and slowly pour in the beaten egg. Let it stand for a few seconds to allow the hot soup to partially cook the egg. Stir in sesame oil and serve at once. Sprinkle the top of each serving with green onions. Cover wood ears with very hot water, soak 30 minutes. Clean, rinse, drain; finely shred. Soak golden needles in hot water 30 minutes, drain, cut off and discard hard ends, cut in thirds. Marinate pork with sherry, soy, and cornstarch. Let stand 30 minutes. Heat 2 tablespoons oil in wok or skillet at medium heat, add ginger slices. Scramble eggs, remove, cut in fine pieces. Increase heat, add remaining tablespoon oil, and stir fry pork. Add scallion, wood ears, golden needles; heat through, about 3 minutes. Return scrambled eggs to skillet and mix. Paint a Mandarin pancake (flour tortilla) with Hoisin sauce, add meat mixture, roll up and eat. Chop pound mushrooms. In large saucepan melt 4 tablespoons butter. Add 1/2 of mushrooms with onion and garlic. Saute. Stir in broth, water, tomato paste, salt, pepper and bay leaf. Heat to boil. Stir in barley, wood ear mushrooms and sherry. Simmer 30 minutes. Add celery and carrots and cook covered for one hour. Serve in bowls with dollop of sour cream. Marinade the chicken for about an hour. Heat oil in wok, followed by garlic and chinese mushrooms. Fry till garlic begins to brown. Add carrots, wood-ear fungus and lily buds. Stir-fry for 2 minutes. Remove and set aside. Place chicken on a suitable plate for steaming. Place the pre-stirfried vegetables on top of the chicken. Steam in wok / steamer for at least 20 minutes or until chicken is thoroughly cooked. Heat a wide heavy skillet. Add cooking oil. When oil starts to smoke, add annato seeds. Sauté until oil turns bright red. Remove annato seeds with a slotted spoon. Sauté garlic until golden brown. Add onions and cook until transparent. Add chicken, soy sauce and oyster sauce, season with salt and pepper and lightly brown. Add carrots and other vegetables if using stir-fry for 15 seconds. Remove and set aside. Pour in 1 cup of stock and bring to a soft boil. Add vermicelli noodles, pressing them into the liquid. Lower heat, cover skillet and simmer for 5 minutes. When dry, add another cup of broth. Stir chicken meat and carrot mixture and wood ear mushrooms into the noodles. Cover and simmer for another 5 minutes. Test noodles for doneness. Add more stock and simmer longer, if necessary. When sotanghon is tender and all the stock is absorbed, add green onion leaves and cilantro, adjust seasoning with salt and pepper. Stir for a few minutes until the green onion leaves are slightly wilted. Serve hot.